The Crimson Tide lose in straight sets to the Bowmen and now sit in a three-way tie for first in the Pacific Conference. Things just got interesting in the race for the Pacific Conference volleyball championship. Faced with an opportunity to firmly settle themselves in the driver's seat for a league title, Glencoe sadly fell flat, falling victim to a 3-0 sweep at the hands of second place Sherwood in a key battle Thursday, Sept. 27, at Glencoe High School. The Tide, having already beaten both Sherwood and Liberty - who were tied for second place a game behind Glencoe entering Thursday's game – as the teams began the second round of league games, were a win away from a dominating position atop the standings. But from the get-go, Sherwood played like a team desperate for a win, while the home Tide appeared out of sorts en route to a straight set defeat. 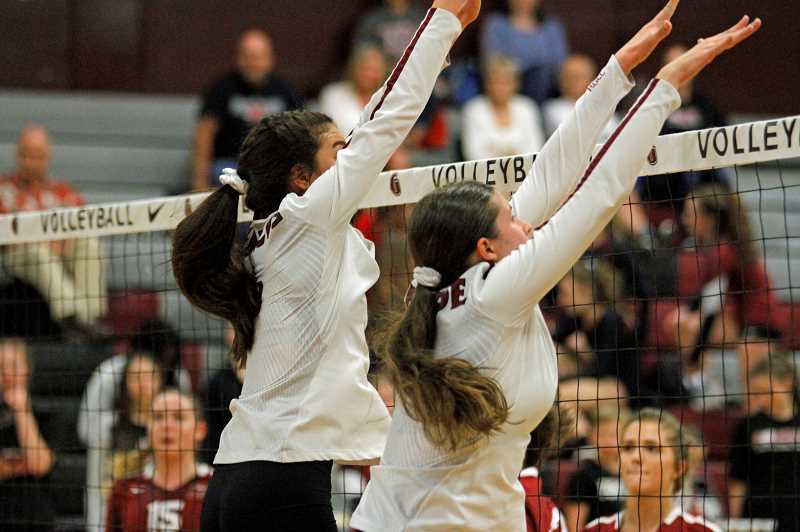 "This was one of our most difficult matches largely because we were simply unable to find a rhythm the entire game," said Glencoe head coach Mike Gaffaney. "Our hitting was off and we were not able to play consistent defense, but that probably also had to do with them hitting well and often." The Bowmen used a lethal combination of dominating net play and defensive wizardry to stymie Glencoe kills, while finishing their own opportunities at the Tide's expense. Sherwood's junior outside hitter Alli Douglass, along with Evan Parent-Korsness, Claire McGill and Alyssa Haslip, dominated the net and simultaneously limited Glencoe outside hitters, Jayda Lee and Morgan DeBord, during key parts of what would prove to be an impressive Bowmen performance. Douglass finished with 14 kills on the night, while Parent-Korsness, McGill and Haslip combined for 14 more finishes, in addition to a couple handful of blocks, many at some of the matches most key moments. Sherwood took the first set rather easily, building an early lead and cruising to a 25-14 win. The second set however was far more touch-and-go, as the home Tide appeared poised to make a game of it when after seemingly waking from their slumber, took an 18-12 and later a 21-14 edge well into the second set. Yet the Bowmen responded, charging back with 10 of the set's next 12 points primarily on the back of Douglass, who tallied five kills in that stretch to give Sherwood a 24-23 lead. But like any good team, Glencoe didn't quit, tying the game at both 24 and 25 before the Bowmen took a 26-25 edge then iced the set when a Jayda Lee spike went long, putting the visitors up two sets to one. The third set was more of the same, with the two teams trading the lead and neither gaining more than a three point edge beyond the Tide's early 4-0 lead. But like the set before it, Sherwood made the plays when it mattered most, turning a 22-21 deficit into a 25-23 win, to take the set and match in what could only be described as in a surprising manner. "We produced 21 hitting errors in a three set match, so if we're looking to complete that won't cut it," Gaffaney said. "A loss like this gives us a lot to focus on through our next couple of practices, and we'll use it as a motivator to improve our offense." Unofficially, sophomore Jayda Lee led the Tide with 14 kills, two aces and a handful of blocks, while senior Morgan DeBord chipped-in seven kills and two aces. Combined with Liberty's loss to Newberg, Glencoe, Sherwood and Liberty all sit atop the Pacific Conference standings at 5-2, with Newberg just a game back at 4-3. With their win over the Tide, Sherwood evened the two team's season series, while Glencoe holds an edge over Liberty by virtue of their straight-set win over the Falcons, Sept. 12, and will travel to Liberty Oct. 8, to end their season series. "It's shaping up to be a close fight for first in our new league and we should be excited for every remaining league match because each one will matter," said Gaffaney. "I'm confident we will improve from what was probably one of our most unproductive matches this season. We definitely learned a lot and better understand we need to play at a high level to compete against the stronger teams in our league."